Journalist and New York Times bestselling author Max Blumenthal joined Radio Sputnik's Loud & Clear to talk about his confrontation with the neo-Nazi leader at a Senate building in the nation's capital on Monday and more in a wide-ranging interview. "Parubiy was in Washington, actually for the second time," Blumenthal said. "Last year he had a meeting with John McCain, of course, and Paul Ryan, Republican Speaker of the House. And this year he met with Ryan and some State Department officials," Blumenthal told Loud & Clear hosts John Kiriakou and Brian Becker. "Then, he was welcomed in this press conference at the Senate Hart Building. It was a totally packed room, filled with [Capitol] Hill staffers, lots of media, lots of foreign policy people — I mean major foreign policy people who worked on Eastern Europe in the Obama administration, Trump administration." ​Blumenthal noted the "bipartisan consensus on display in the room." Parubiy was "on stage with three other Eastern European speakers of parliaments from countries that have basically volunteered to be bases for NATO operations." Blumenthal was "struck by the fact that no one seemed troubled by Parubiy's background as the founder of two neo-Nazi parties in Ukraine, which are rampaging across the country committing anti-Roma violence and really menacing all sorts of people: dissidents, leftists and Jews," he told Sputnik. Parubiy's agenda during his visit to America was to push for Washington to do more to fight the Nord Stream 2 pipeline, which is planned to span the Baltic Sea from Russia to Germany, with construction slated to finish in 2019. The pipeline poses an "existential threat to US economic dominance" over Europe, Blumenthal explained. Parubiy founded the Patriot of Ukraine party and the Social-National Party of Ukraine, both of which used a symbol with the cyrillic characters for "I" and "N" to denote its "Idea of the Nation" ideology. The emblem itself bares resemblance to the Nazi Wolfsangel symbol. 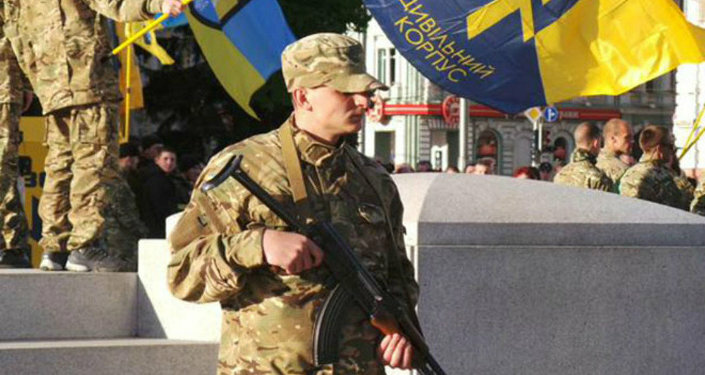 The Patriot of Ukraine later branched into the Azov Battalion and Right Sektor, two fascist groups with paramilitary tendencies that were critical in the Maidan revolution — which saw the ousting of former Ukrainian President Viktor Yanukovych in early 2014 — and whose spree of violence in the country has not stopped since. Blumenthal notes that the US government stopped arming the Azov Battalion in March 2018, citing it's neo-Nazi tendencies. 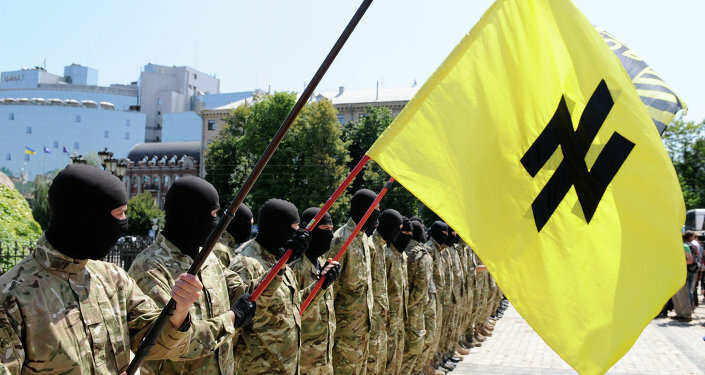 "I am very pleased that the recently passed omnibus [bill] prevents the US from providing arms and training assistance to the neo-Nazi Azov Battalion fighting in Ukraine," Rep. Ro Khanna (D-CA) said at the time. Nonetheless, the group probably still benefits from US support, as it has been incorporated into the National Guard of Ukraine. As for the Social-National Party, "if it sounds like the National Socialist party, that's because it was directly inspired by the Nazi party," Blumenthal noted. When Blumenthal raised his voice in opposition to the warm welcome Parubiy was receiving, "the head of the American Foreign Policy Society didn't even know that I was referring to the person sitting directly to his right," Blumenthal said. Instead, he gave a "rousing" defense of WWII Nazi collaborator Stepan Bandera, who was involved in the extermination of the city of Lviv's Jewish population during pogroms in 1941 who formed 32 percent of the city population, a death toll that amounts to tens of thousands of people. "The thing is that Bandera is really the hero and icon of post-Maidan Ukraine." "Streets have been named after him," Blumenthal noted, and with the backing of Parubiy himself, a memorial was built to Bandera in Lviv. Blumenthal's objection was dismissed as being "Russian propaganda" by a former US official present at the event. In the name of fighting Russia, US funds are going directly to neo-Nazi groups such as C-14, which has been committing pogroms against Ukraine's Roma population.